Trump Jr. posted on Instagram that his father's tweet about Warren was "savage." Donald Trump Jr. called a tweet by his father about Democratic Sen. Elizabeth Warren "savage" in a social media post Saturday. Warren officially announced her run for president on Saturday, which drew a tweet from President Trump that referred to the Massachusetts senator as "Pocahontas." He also added, "See you on the campaign TRAIL, Liz." It's unclear why he capitalized "trail," though some speculated online afterward that it could have referred to the "Trail of Tears." The "Trail of Tears" was a forced relocation of the Cherokee, Chickasaw, Choctaw, Muscogee and Seminole tribes in the wake of the Indian Removal Act of 1830. Tens of thousands of Native Americans were removed from their lands and forced to march to Oklahoma, with thousands dying as a result. ABC News reached out for comment from the White House on the apparent reference, but did not receive a response. Trump Jr. later posted the tweet on Instagram, saying: "Savage!!! Love my President." The post included a retweet of the president's initial post. That retweet referred to Native American genocide. "The Native American genocide continues with another murder by the president," the tweet read. ABC News reached out to the Trump Organization Sunday, but did not immediately hear back. The nonprofit United to End Genocide estimates that there were about 10 million Native Americans before European settlement and just 300,000 left by 1900. The president's taunts of Warren's ethnicity center around her claims of holding Native American ancestry. The senator took a DNA test last year that showed she was overwhelmingly European, but it did support the existence of an unadmixed Native American ancestor in her pedigree six to 10 generations ago. She apologized last week after The Washington Post reported she registered for the State Bar of Texas in 1986 as an "American Indian." 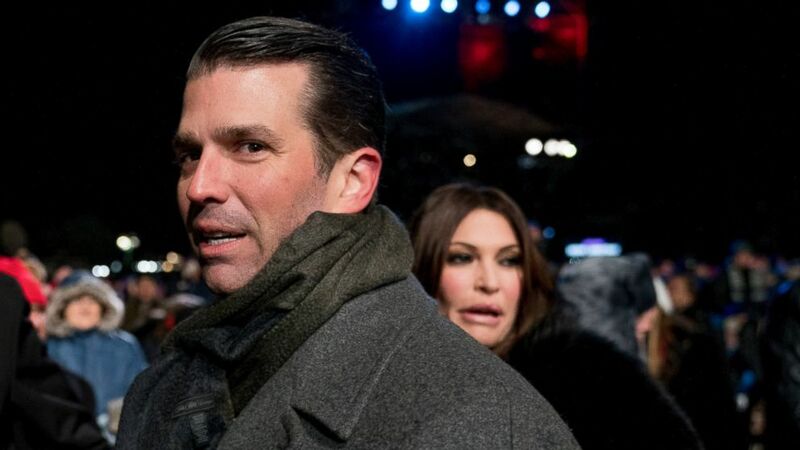 (AP) In this Nov. 28, 2018, file photo, Donald Trump Jr., center, and Kimberly Guilfoyle, right, depart following the National Christmas Tree lighting ceremony at the Ellipse near the White House in Washington. ABC News' Alex Mallin and John Santucci contributed to this report. Editor’s note: An earlier version of this story included references to Native American heritage and genocide that was unclear about who posted them to social media. An updated version accurately reflects the post.